From the Civil War to Vietnam and beyond, Wesleyan students and alumni have been called upon—by conscience, patriotic fervor, conscription, or some combination thereof —to enlist and fight. The causes and the military technology have changed dramatically over the past nearly 150 years, but many of the human issues of earlier wars resonate today. During all of these wars, college officials walked a fine line between urging students to stay in school and supporting them as they went off to fight or serve in other ways. Then as now, many young men were conflicted, and, after the initial rush to action, some changed their minds. An anonymous member of the Class of 1864 recalled, in the March 15, 1880, Argus, that the war fervor proved hard to sustain. 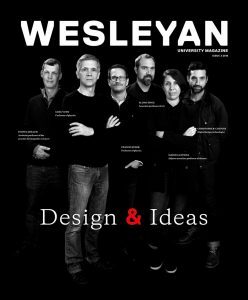 “At first it appeared as if Wesleyan might send an entire company into camp. But the numbers diminished as the weeks rolled by. Some received discouraging or forbidding word from home; some felt their enthusiasm cool when it was found that the war would last more than a month, and some who had made very belligerent speeches ?, finally came to the conclusion that they were studying for the ministry, and couldn’t go, unless as chaplains. So when the mustering officer came along, and the enlistment papers were signed, there were only 14 in the students’ company.” These men became a part of the Fourth Connecticut Volunteers. Not everyone who fought volunteered immediately, of course, and many were not students at the time the war began. Military conscription was first instituted by the Confederacy in 1862, and by the Union the next year. Prevailing national sentiment, however, was that those who were drafted were less loyal to the cause than those who enlisted voluntarily, and there were riots as a result, most famously in New York. Only 6 percent of those drafted actually served; the rest paid to be exempt or hired substitutes. Twenty-four of Wesleyan’s Civil War soldiers fought for the Confederacy. As one of the very few Methodist institutions of higher education at a time when Methodism was especially strong in the South, Wesleyan attracted a significant number of Southern students. These men are rarely, if ever, mentioned in the many reports of reunions of Wesleyan Civil War veterans. When Congress declared war on Germany on April 6, 1917, at the urging of President Woodrow Wilson (who taught at Wesleyan from 1888 to 1890), colleges and universities supported military training almost immediately. By April 16, 300 Wesleyan men began intensive military training. An undated letter to alumni calling for contributions to Wesleyan states that about a quarter of the undergraduates had enlisted, including half of the senior class. In his 1917 Commencement address, Stephen Henry Olin, Class of 1866 and a prominent member of Wesleyan’s Board of Trustees, praised Wesleyan for supporting the President’s call to war. “We may applaud the college authorities for making room in the plan of study for military science and the military art, for presenting a college battalion armed, uniformed and well instructed, for offering to the government the use of its laboratories and such aid as falls within the special competence of the members of the faculty, for counseling and aiding the students on their way to ambulance and training camp and barrack. In service and in sacrifice Wesleyan seeks to be in the foremost rank.” At Wesleyan and other colleges and universities, the Students’ Army Training Corps (SATC) and the Reserve Officers’ Training Corps (ROTC ) predominated on campus. Wesleyan’s war record, a list of all who participated, including SATC members, runs to 16 pages. The Wesleyan University Archives welcomes researchers interested in Wesleyan students’ war participation or protests, or any aspect of life at Wesleyan. We would be glad to provide a home for your memories of Wesleyan during wartime. Thanks to Wesleyan editor Bill Holder ’75, who proposed the topic for this column.